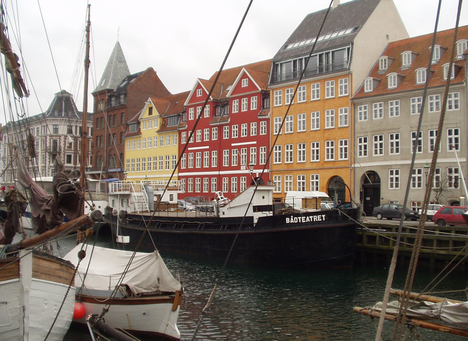 About two hours by airplane from Paris, Copenhagen is a small city with a population of 100,000. There are three sights to see, The Little Mermaid, Tivoli and Christiania. This Christiania area is a world-famous area for soft drugs. Once you step into this area, anyone can enjoy soft drugs freely. Close by Christianshavn, it’s as if we are in another world. There’s a huge hippie community in the central part of smart Copenhagen. Unpaved dirt roads are mixed-up and give us a feeling of what hippie is. The outside appearance covered with spray-painted graffiti or decorations with junk looks like a dilapidated house, but the inside of the house looks relatively tidy. I hear that rich men, intelligent and famous philosophers live in this community. This area has all kinds of shops from a vegetable store to D.I.Y shop and public shower. Besides, there are a large number of stores sell drugs. It’s really overwhelming to see that drugs like hashish or marijuana are sold boldly on the street. A man is prowling about with a vacant look and girls are smoking hashish… It’s a strange place. Why can this area be liberated from the police? I asked one of my friend who studied together in Paris and now living in Copenhagen. “They love soft drugs, but they are opposed emphatically to hard drugs. When Health Angels came into this area, Christiania didn’t accept them. They united against them and kicked them out. The police and people live here approved of Christiania because they’re thorough about only soft drugs.” Their electricity and water charges are covered by residents’ tax. Denmark is also the only country that approved of marriage between homosexuals. When will the world catch up with this country?